For many, the deal breaker for the Logitech Revue and other Google TV products was two words: IR blaster. Opting to act as a supplement to your current home theater set-up rather than a replacement for a cable/satellite set-top box, the device was hamstrung by a somewhat complicated set-up process. But this was never about the hardware, the workhorse of this product was the Android-based OS behind it all. Bringing the web to the TV has been a concept bouncing around the consumer electronics industry for years, and Google’s effort leveraged the Chrome browser to bring any content to your living room. The execution, though solid, failed to meet expectations; primarily because there seemed to be so much left on the table. Like Apple TV, Google TV products had no access to the apps that made their respective OS’s so popular and full featured. 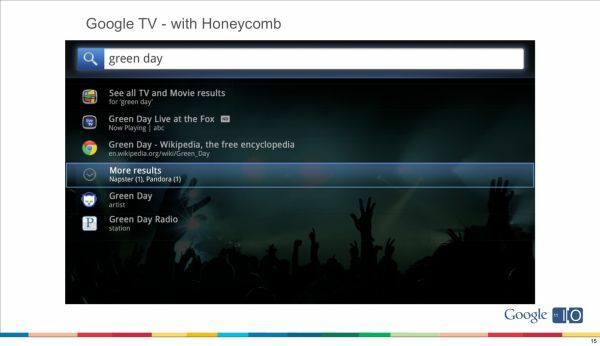 Google used I/O 2011 to announce that apps would be coming to Google TV during a reset that brings Honeycomb 3.1 to the table. First reported by GTV Source shortly after the conference, Google went so far as to invite some developers to participate in a beta of the new software under a project called ‘Fishtank.’ In recent days there’s been signs of progress in this program based on the appearance of device listings for Google TV devices under the Android Market’s settings menu. Though apps could not yet be sent to user devices, this was a good indicator. Now, it appears that the changes to the Android Market may be tied to the Fishtank programs deployment. As reported by Geek.com’s Russel Holly, images and details of the hardware received by Fishtank developers have been revealed, and there's plenty to see. The hardware closely mirrors that of Logitech’s Revue, featuring the same Intel CE4100 SoC and even the same wireless keyboard. Port selection mirrors the Revue but is notable for the presence of a blanked out second HDMI-in port; a coaxial connection is noted but, based on its size and appearance, is likely to be used with a WiFi antenna. 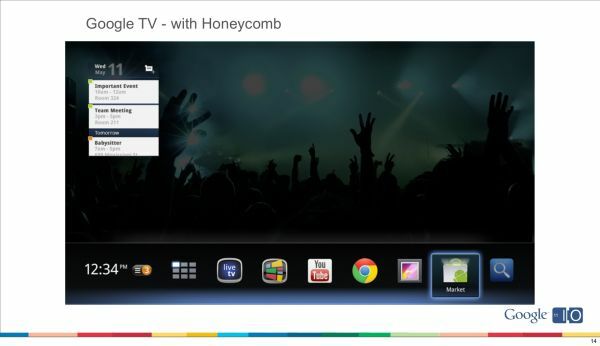 Loaded in the device is what’s known as Google TV 2.0 beta, the Android 3.1 based OS we’ve been waiting for, complete with apps. Unfortunately the only apps presently available are a Clock app and Live TV app, whose source is the HDMI input on the device. The interface retains Honeycomb’s blue and black theme and shows plenty of effective optimizations for the big screen. Fishtank is supported by a private Groups message board, through which the main request from the 50 or so participants is the ability to overlay video with data from an application. This feature is apparently available while on the home screen, but not open for developers to use. 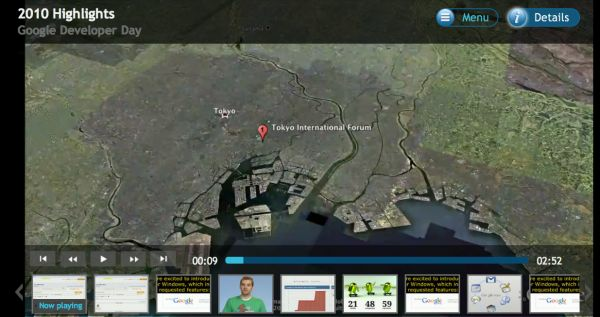 Fishtank isn’t the only testing ground for Google TV 2.0, though. We can confirm that Logitech is testing the new software on Revue units on their campus and working with in-house developers to prepare a suite of apps for its users. Current Revue owners can expect the new software to land late this summer, a broad window to be sure, but better than no window at all. Logitech would not comment on new hardware, though with such an upgrade in software it would be surprising to not see something new in hardware. It’s certainly comforting to see that GTV early adopters will not be left behind, as can so often be the case. More information on Google TV 2.0 as it becomes available. I've been an Android early adopter from the start *cough*sucker*/cough* but the upgrade to the Logitech Revue has been the thing I'm MOST anticipating. We use the Google TV box regularly right now, but it's just too slow, clunky, and version 1.0-ish. If they can pull this off without me having to buy a new Google TV box, Logitech will have taken themselves off the naughty list. 3) Perfect quality, small order accepted . 4) 100% safe door to door delivery, within 5 - 7 days air express for small orders . Will TV's be the de-facto device for casual browsing? The biggest draw for me seems to be their always on/instant on capability....and the comfort factor that most people have with ther TV's. TV's come across as non-threatning & accessible as compared to the complexity perceived to be inherent with computers. This kind of convergence is risky if the cost isn't almost nil. I think Gruber or Gartenberg covered this recently, the TV is not a good convergence device because you don't replace your TV as often as almost anything else in the house. Indeed, but for the HD switchover, I don't know anyone that has replaced a TV that was working just fine. Sorry, editing at midnight makes things tough. Will go through it again with a fine toothed comb. Throw me any suggestions. Thanks.